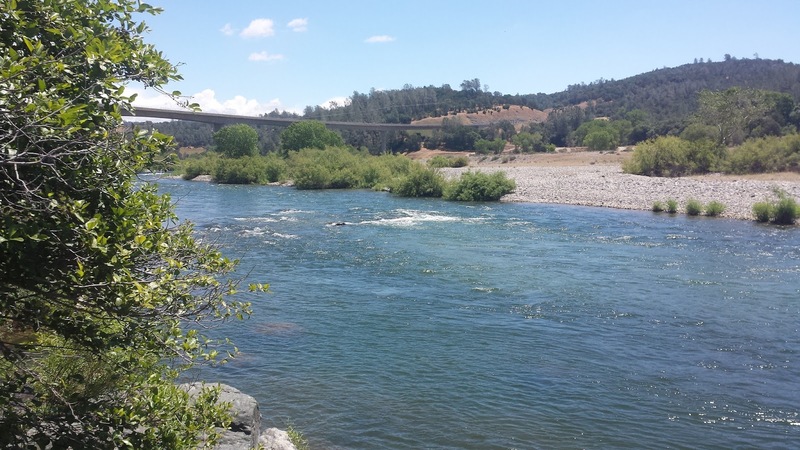 Another week of high Yuba flows means tough fishing and no pressure. I found the fish though, I always find them. Three hook-ups, three in the net. The warmer months are a tough time to fish the Yuba. Not much is happening with the bug life but with a few secret tricks I was able to hook and land three fish over the 16" mark. 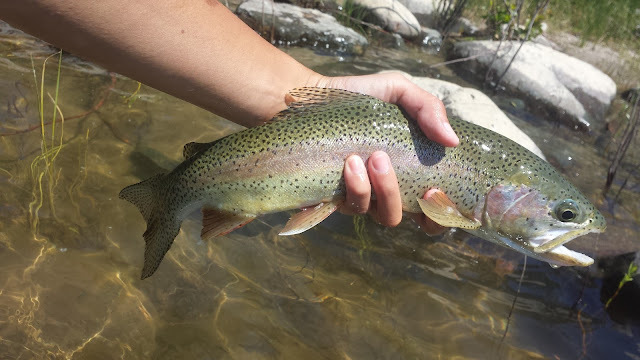 The fish hooked to amount of time spend ratio was good this trip at about one fish per hour. The conditions were bright with high flows and gin clear water, some of the toughest conditions you can face on the Yuba. The longest fish I landed this trip had a huge head but skinny body almost like he was starving. I've heard that when big storm events with huge flows blowout the Yuba several times a lot of bugs get dislodged and blown away downstream. Once the river settles and the flows go back to normal the fish have a hard time finding food which causes them lose a lot of weight. Could we possibly see this event again? It's too early to tell at the moment but I'm crossing my fingers it doesn't happen. Another theory that could explain why this fish was skinny could be related to the spawn. Fish tend to use a lot of energy when they are spawning and it's not uncommon to find them looking like they haven't eaten in several weeks after they are finished. 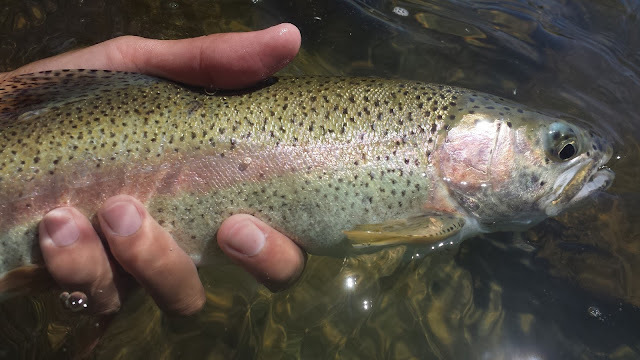 Yuba bows spawn in the spring which means that there could be a few fish in the system in their post-spawn bodies. The flows have been cranked up and the wading is even more difficult than before. Waders were necessary if you want to hook fish in the run I was in. The water is high, discolored, and colder than usual. I went out one evening this week and hooked a couple of small male shad. 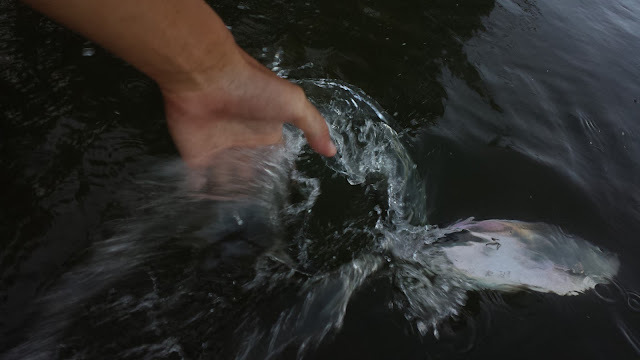 Nothing too exciting, shad to be had. The lake was stocked this last weekend with catfish for the Kid's Fishing Derby. As always there are a lot of dead catfish floating along the banks after the event due to the heavy fishing pressure and bio imbalance. Why the organizations that put this event together don't clean up their mess after it's over is beyond me. As I drove around town today I saw a man with a pool cleaning net cleaning up their mess. Bless that man, the Guardian of the Lake. There are a lot of anglers bait and waiting the lake but very few are catching any fish. 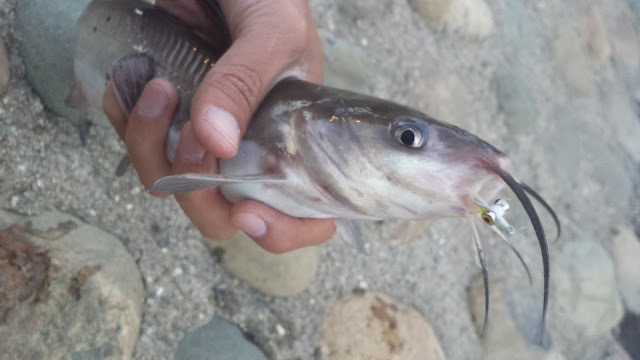 After top water fishing for bluegill in the evening, I finally caught my first catfish of the year on a clouser.